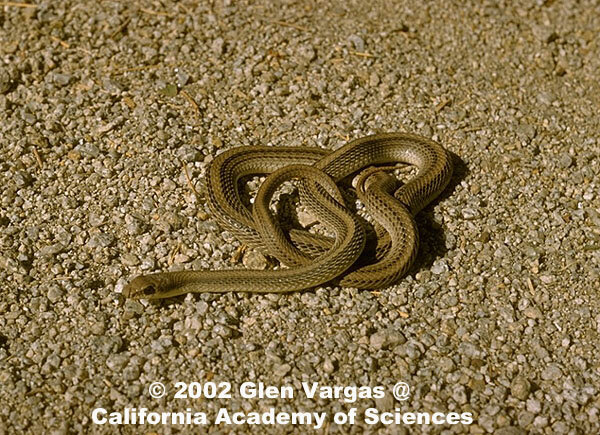 The snake above was found at 4,000 ft. in San Diego County in an area where snakes with the appearance of both S. h. hexalepis and S. h. virgultea are found, but the broken side stripes, the mostly 3 scale wide middorsal stripe, and the pale color of the top of the head indicate that it is a Desert Patch-nosed Snake. A cold and sluggish Desert Patch-nosed Snake is gently prodded with a stick to encourage it to move for the camera, but the snake retaliates by racing away in a blur in typical patch-nosed snake fashion. An intergrade patch-nosed snake on a dirt road in the morning makes a few attempts to get away from me, then after waiting patiently for the right moment, finally dashes across the road to freedom. Salvadora hexalepis ranges in size from 10 - 46 inches long (25 - 117 cm). Most snakes seen will be around 26 - 36 inches (66 - 91 cm). 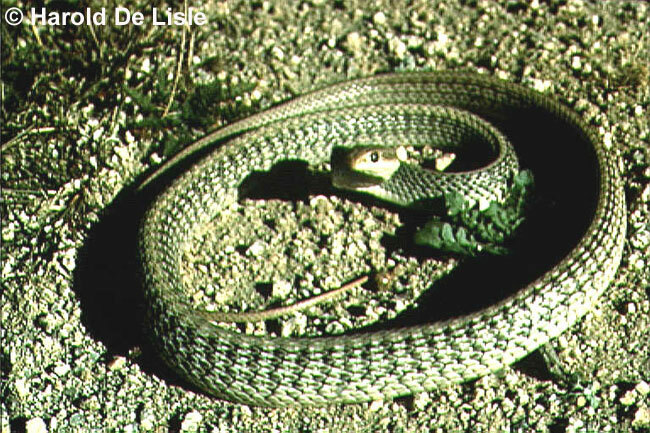 A fast, moderately-sized slender striped snake with smooth scales, large eyes, and a large scale over the tip of the snout. There are 9 upper labial scales, one usually reaches the eye. Well-camouflaged, this snake is pale gray with a broad yellow or tan stripe down the middle of the back, and dark stripes on the sides. The middorsal stripe is usually 3 scales wide. The underside is cream, sometimes shading to pale orange at the tail end. The top of the head is gray. Comparison of the 3 subspecies of Salvadora hexalepis found in California. Little is known about the natural history of this species. These notes are based on observations of the species as a whole. Diurnal - active during daylight, even in times of extreme heat. Terrestrial, but also climbs shrubs in pursuit of prey. Able to move very quickly. Acute vision allows this snake to escape quickly when threatened, making it sometimes difficult to observe or capture during the heat of the day. The enlarged rostral scale (on the tip of the nose) is thought to be useful in excavating buried lizard eggs. When When cornered, will inflate the body and strike. , they will inflate the body and strike. Eats mostly lizards, especially whiptails, along with small mammals, and possibly small snakes, nestling birds, reptile eggs, and amphibians. 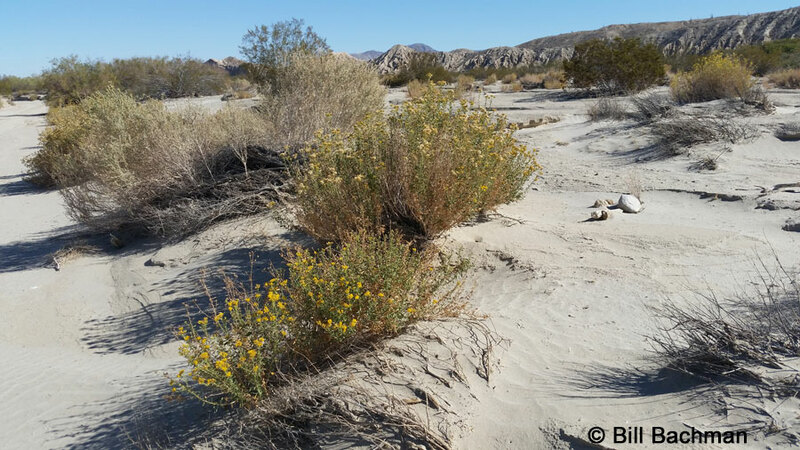 Inhabits open arid and semi-arid areas - deserts, brushland, grassland, and scrub in canyons, rocky hillsides, sandy plains. 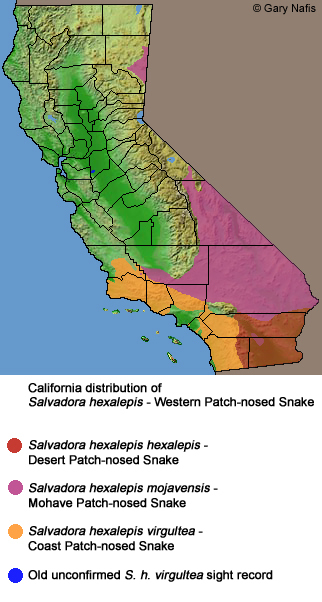 The species Salvadora hexalepis - Western Patch-nosed Snake, is found in southern California, Nevada, extreme southwestern Utah, Arizona, southeastern New Mexico, west Texas, and south into western Mexico, including Baja California. 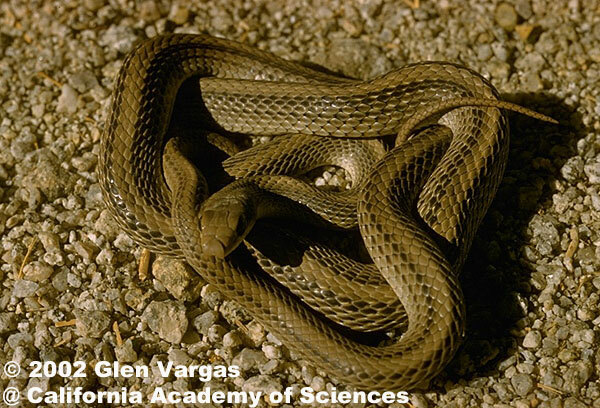 This subspecies, Salvadora hexalepis hexalepis - Desert Patch-nosed Snake, occurs in California in the southeast, from the desert slopes of the mountains north to roughly Riverside County, and beyond the state south into Baja California and Sonora, Mexico, and east into southeastern Arizona. 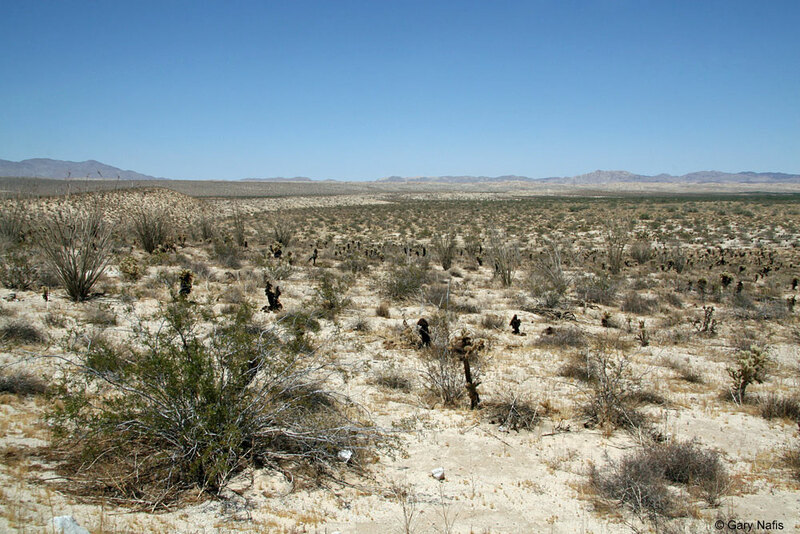 which occurs in the Southwest, is recognized by some taxonomists as a unique species, Salvadora deserticola. Salvadora - Latin - salvus - whole, sound, well preserved and dura - hide or skin -- "body covered w/smooth scales"
The common name is sometimes written Desert Patchnose Snake. NatureServe Global Ranking G5 The species is: Secure—Common; widespread and abundant.